Purchasing an RV is a dream come true for most people, but it can be a nightmare for others. We believe in helping all RV buyers obtain the information and protection they need to make an informed buying decision, and then protection for their purchase. Assistance is available whether you are buying from a private seller or an RV dealer. Having peace of mind while traveling in your RV makes the travel so much more enjoyable! How can you have that? By having an RV extended warranty that safeguards against unexpected repairs. Wouldn’t it be better to not suffer undue financial stress over an RV repair bill that could be in the thousands of dollars? Warranties are offered by vehicle manufacturers and they extend the original warranty for a period of time. 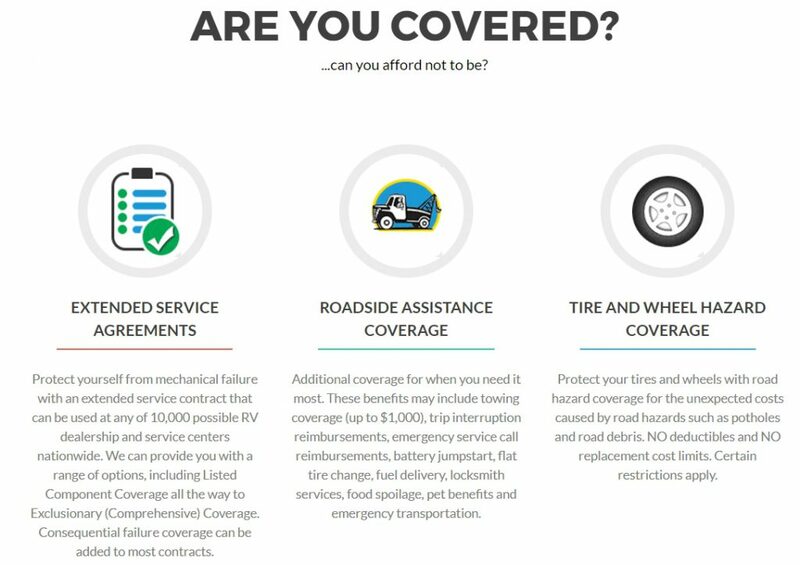 An RV extended warranty, or an extended service agreement or contract is typically offered by a third party service or insurance company. These agreements allow RV service work to be performed at different locations: the RV dealership where the vehicle was purchased, other dealerships, or repair facilities located anywhere in the United States. An extended service agreement is a shield against those unexpected repairs. It helps to alleviate the financial stress of repair costs and replacement items when things break! These extended warranties are also transferable to future owners if the RV is sold prior to the extended warranties expiration. This can definitely increase the resale value of the RV! It also gives the buyer additional peace of mind in making that purchase as the RV may no longer qualify for another agreement. 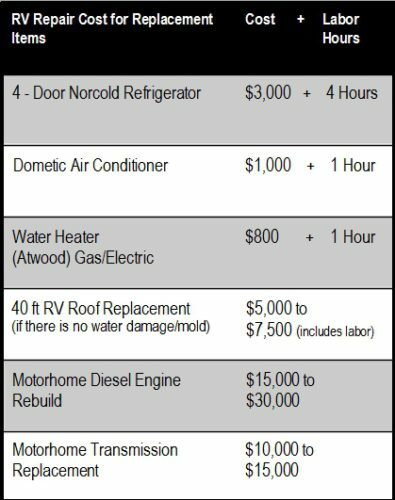 Also, not only are their repair and resale benefits, these RV extended warranties offer other benefits like roadside assistance, key lockout services, car rental discounts, food replacement costs due to equipment failure, and travel expenses if the RV breaks down far from home base. RV extended warranties cover most of the RV’s major mechanical components and the RV appliances, but they are not as extensive as the bumper-to-bumper warranty that comes from purchasing a new RV. No matter how good the program maybe it will still have exclusions for items like light bulbs, headlights, and batteries. These are items that are considered as “exclusions.” There are other items on the RV that will wear out over time: brakes, shocks, and tires for example. These items will almost always be excluded from the extended warranty. Then Why Would You Buy an Extended Warranty? These types of agreements are perfect for the person who does not want the unexpected repair bill that could really hurt them financially! If you are planning on purchasing an RV, and it does not have the original manufacturer’s warranty, an RV extended warranty may be just the extra level of comfort you need when making that purchase. RV parts and replacement costs can be expensive. Not only that but in the process of securing the extended warranty, the RV will be inspected by a certified NRVIA RV inspector, if you choose the right RV extended warranty company! When it comes to RV extended warranties, some of these are less expensive and have more inclusion than others. If this idea sounds like a winner for you, then choose a policy that fits your budget and includes a deductible that also makes sense. If you choose wisely you may find a policy that not only covers repair costs but even pays for itself with increased resale value in later years! How Do I Get an RV Inspection? If you want a pre-purchase inspection which includes more information than the standard RV extended warranty inspection provides, please visit used RV Inspection to request a list of recommended Certified NRVIA RV Inspectors for your area. Once the inspection has been completed, a copy of your inspection report will be accepted to qualify the unit for coverage. If you are only interested in a warranty inspection to qualify the unit for an extended service contract, simply allow scheduling of the RV inspection when it is convenient for you and the seller. You’ll pay for the inspection up front and this fee will be applied towards the purchase of the extended service contract.